The wonderful Bronnie over at Maid In Australia is having some wonderful giveaways for mental health month. I think it's a wonderful idea and I'm joining in. I was offered to review Busby Pure Tissue Oil and I jumped at the chance. My skin gets so dry especially when the weather is cold. I also have some little scars on my legs that I hate. I thought trying this oil would be perfect as it's clinically proven to improve the appearance of scars, stretch marks, wrinkles, ageing skin and dehydrated skin. The first thing I noticed was the size of the bottle, it'd last so long with the small amount used daily. It's made from avocado, grape seed and rose hip oils and smells divine. Although it's an oil it doesn't feel greasy like some do. I has mad photo skills yo. I planned on using it twice daily for two weeks but lufflump hid it for a couple of days then baby brain really took hold so forgetting my name took precedence over everything else. So in total I've managed to use it almost daily for about a week. Honestly, I've already noticed a slight difference of some scars which is wonderful as the weather gets warmer. I'd take photos but I haven't shaved my legs in weeks and no one wants to see that. It's important for our mental health to look after ourselves, to feel like we are worth it. The wonderful thing about Busby Pure Tissue Oil is not how natural it is or the smell or the oils but that it can be used as massage oil. So relaxing! Lufflump and I are going away on a family trip this weekend and I've packed the oil to massage my mum's always aching back. 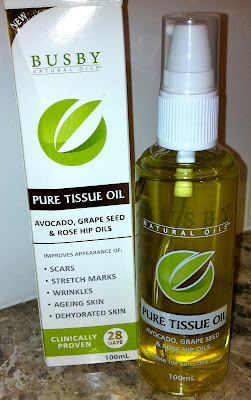 Thanks to the wonderful people at FGB Natural Products, I have four 100mL bottles of Busby Pure Tissue Oil to giveaway. Just comment below telling me how you like to pamper yourself. 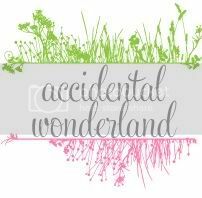 It'd also be wonderful if you could like Tutu Ames and Busby Australia on Facebook. Competition closes on Sunday 30th October 2011. Unfortunately this competition is only open to Australian entrants and only one entry per household please. Disclosure: I received a complimentary 100mL bottle of Busby Pure Tissue Oil courtesy of FGB Natural Products. No financial payment was offered nor accepted for this post. All opinions expressed are purely my own. Ohh! I've got some stretchmarks post baby #2 that are really weighing on my mind. I escaped stretchmark-free after my first, and stupidly thought I wouldn't have stretchmarks at all. I feel really self conscious, especially because they draw extra attention to the extra 'pooch' I've got there! How I like to pamper myself? I spend faar too much money on a daily cleanse/tone/moisturise routine, and then three monthly visits to the dayspa. Niccceee. ooh I love natural products and my skin is always dry. How do I like to pamper myself? Does going to the gym count? I do that. I also love facials and pedicures but that happens maybe once or twice a year. My treat to myself is usually a magazine, never anything pampering! It was a long time before I came around to the whole notion of 'pampering myself'. Now, though I try and look at it as a way of sustaining myself! I give myself little manicures, and I try to make time for the things that I love doing just for me, like swimming and taking italian lessons. Nothing much, but it helps me get through! I love to light some scented candles (chocolate scent is my favourite) and run a bubble bath. Then grab a gossip mag or good book and have a long relaxing soak...it's a rarity though!! I'm getting married 2 weeks from today ( argh! ). I'm going on a honeymoon after that and i'm pretty sure my fiance/husband owes me a massage - paint your own picture! I like to pamper myself with facials. I had my first one in AGES last week and it was divine. I *really* need to do it more often. Oh well, off to water my money tree!! I had my first massage in 12 months last Saturday & it was divine so that would be my favourite pampering. I would love to try this oil out on the nasty stretch marks that my gorgeous baby girl gave me! I would love to win this for my 14mo daughter, she has a scar on her hip where the surgeon nipped her during c-section (grr, a lot). Can the winners please email me your address at ames@tutuames.com?